I teach an Advanced Precalculus class, and I love my kids. This is my second time teaching the course, and I get a rush seeing the kids dive into whatever we do with full intensity. Because the curriculum we teach is so chalk full of things, we don’t really get days where I can go on tangents and have students explore things that I think would be of interest to them. What I loved about this? It gave kids the freedom to explore mathematics that interested them. The assignment was fairly low-pressure. I wanted to do something similar. I knew I wanted it to be low-pressure to do, fairly easy to grade, and really focus on what the kids want to do. Thus, Explore Mathematics! was born. 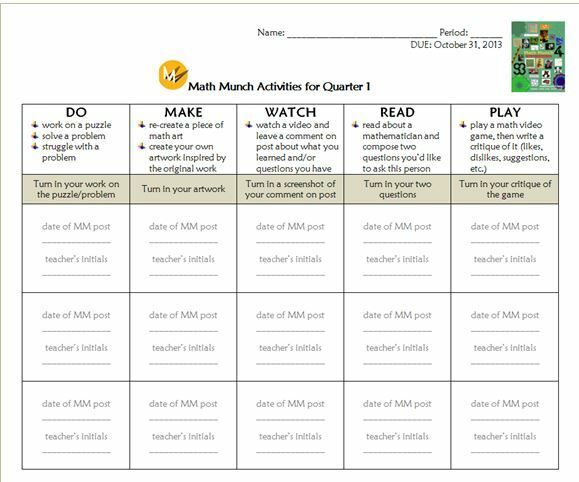 Students are asked to engage with mathematical things that they are interested in during the third quarter. There are two deadlines, so they are working on them continuously and not rushing at the end to finish them. (Also to make marking them easier for me.) There is a low-pressure grading structure, which reinforces the notion that this is more about just engaging and less about “doing the right thing.” In total, I’m making it worth about half a normal test. I don’t know exactly how this is going to turn out. But I’ve already had a student present a piece of mathematical artwork he’s made, and I’ve had a couple fun conversation with kids about things they’re thinking of doing/looking at. I hope this fosters a lot of fun mathematical conversations between me and the kids about the things they’re finding (and of course, among the kids themselves). The biggest concern is making this assignment not seem like or become busywork for the kids. I don’t want it to seem like added work just for the sake of extra work! That’s the fine line I am trying to navigate — sort of “forcing” kids to carve out some time here and there in their busy schedules to get exposed to the cool things out there. I have to figure out how I can create this feeling in the kids. Maybe that means I will give up some classtime for them to work on this every-so-often, to show them I value this sort of exploration. Wish me luck on this. Sam, this is seriously amazing. Our precalc curriculum is fast and furious too, so this is an awesome way to get kids thinking about very cool mathematics without using too much class time. Will you please do a follow-up post once you’ve graded them? I’m really interested in using this next year. I hope so! I always forget to do followups… But if I don’t, pester me! Thanks so much for your post! I have been thinking about doing a similar project with my Algebra 2 students ever since I read Fawn’s post, but I just hadn’t gotten it all together. I spent my “snow day” today creating a plan based on what you and Fawn have done. Wishing us both luck! I saw Fawn’s post and loved it, but hadn’t thought about trying it with my advanced Precalcs. I did however use a simplified assignment with my geometry kids. we just had our 4th and 5th snow day in February alone.We left school Wednesday with “if we don’t have school Thursday, review for your quiz. If we don’t have it Friday= visit Math Munch- play one game and watch one video”. I was shocked that virtually all of them did it- One girl even brought in the hexaflexagon she made after watching the video. – No assignment to make anything , just to watch. They loved the activitities but most weren’t even sure it was math. A win for me. Sam, I may try your idea with the Precalcs in the spring when we have wacky schedules due to testing, or during AP testing week – if I can get a computer lab. This is awesome. What a great idea. Hope you don’t mind that I do a similar project. Thanks for sharing. I borrowed shamelessly for my Geometry and Algebra 1 classes. Easy points and interesting things to do. I love this community and learning from all of you. Thanks to Fawn, Sam, and all the commenter for the worderful ideas.